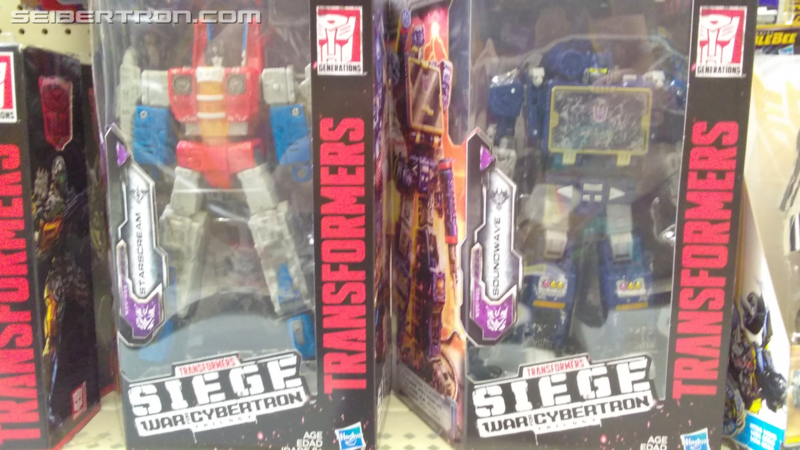 Hot on the heals of the sighting in Australia, we now have photographic evidence that Transformers: War for Cybertron - SIEGE Wave 2 Voyager Class Starscream and Soundwave are in the wild at U.S. retail stores! Seibertron.com member and site moderator Rodimus Prime found the pair at his local Walmart in Albany, Georgia. He took a snap shot of the two new Voyager Class figures on the shelf. Take a look below! The hunt is on! Will you be adding SIEGE Starscream and Soundwave to your collections? Remember, Starscream will be followed up with a repaint into Thundercracker in SIEGE Voyager Wave 4, and previous leaks have indicated a special release of Skywarp to be determined. Soundwave may also be getting a black repaint as his reincarnated form of Soundblaster if the rumors surrounding a "35th Anniversay" edition of select figures is to be believed. We also previously reported on an English language review of SIEGE Voayger Class Soundwave HERE, along with the original Australian sighting of these figures. Tell us your plans for the hunt in the comments below, and stay tuned to Seibertron.com for the latest news on all things Transformers! ....aww, but he is rubbish though, dangit! I had such hopes for you, Barricade, why do you do this to me. I'm gonna repeat a lot of what's already been said, because it's accurate: the color scheme is great (love the purple windows and tires), the mold looks somewhat better here with actual color than as boring white Prowl, but the head ruins it and I wish the guns were bigger. Barricade deserves more than a Smokescreen pretool. Maybe if it looks better in person I'll get it, but for right now I'm nothing but disappointed, and that's sadly what I expected. I don't even want Smokescreen either, he's even more of generic fodder than Bluestreak and this cartoon-accurate neckless head looks stupid. I’m looking forward to see them in person and seeing what happens from there. I’m definitely looking throughout my area. IDWverse. A composite of OG, WFC and Movie. Animated design, based on Movie. Animated design, as per The Complete AllSpark Almanac. So HasTak had Plenty of options and chose none. Nemesis Primal wrote: ....aww, but he is rubbish though, dangit! I had such hopes for you, Barricade, why do you do this to me. 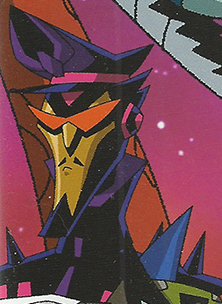 I don't see how Smokescreen is generic considering that 1:He has one of the most unique color schemes in the whole franchise and 2:At the time during the cartoon he was one of the few shady Autobots. Randomhero wrote: I love this for months people were wanting to see barricade waiting and expecting him to be a black prowl and there he is and people are complaiming that that’s exactly what he is and wanted. Ah, but the thing here is that people were expecting him to be a lazy Prowl repaint as a worst case scenario, not what they actually wanted. It's like the small group of people who were expecting Impactor to be an Ironhide repaint: no one really wanted that, but we sadly wouldn't put it past Hasbro to make it. I personally wanted a figure of Barricade's much more unique and distinct Evergreen design, and I know I'm not the only one, but that would have taken effort that Hasbro is apparently adverse to. For sure, the Animated head would have never fit the Siege aesthetics. But with just a little tweak like taking the same concept but with a more square head and less chin. Then it would have been perfect. While I'm perfectly fine with this Siege Barricade, am I alone in thinking that TLK Deluxe Barricade made for a pretty serviceable CHUG crossover? I mean that evergreen design looks heavily based on it. Despite the fuggly buggly movie head, I was happy slapping him on my Gen shelves. Fires_Of_Inferno wrote: I'm gonna buy the hell out of that Barricade, to be sure. Mostly in the off chance that a 3rd party makes a new head/hands for him. Even if reprolables does something like a sticker to cover his face. Maybe if Hasbro even gave him a mouthplate instead of a mouth it wouldn't look as off as it does. Overall though, I'm satisfied with what I see! However, this leads me to believe that they should do "test audiences" for prototype reveals like what they do for movies. That way they can take suggestions on how to alter some things before sending it out to mass market. It would cost more on their end, but it could also make them more in the end. I dunno, it's just the dumb thought that popped into my brain. Like I said, still gonna buy him! Personally I'm hoping for a red visor and/or choice of 'evil facial hair'. Either a mall cop-esque moustache or some goatee or something. 1. He's red and blue, how is that unique? He's not even the first red-and-blue guy, he lost out to at least Optimus and Screamer, probably more than just them. 2. 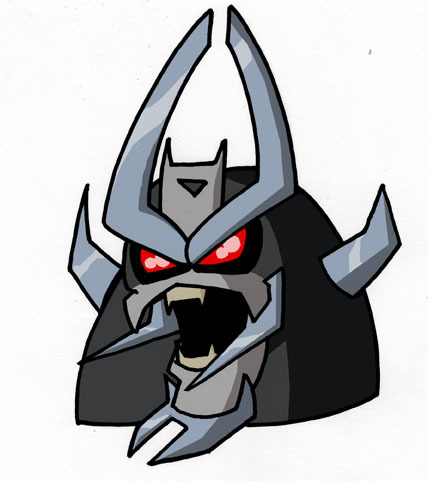 I grew up with the Unicron Trilogy, I haven't WATCHED the G1 cartoon in it's entirety because, unpopular opinion, what I have seen of it hasn't aged well. I've at least seen Bluestreak do stuff in the IDW comics/MTMTE, but G1 Smokescreen isn't IN anything (since Prime Smokescreen was basically just Hot Rod, and Armada Smokescreen was basically Trailbreaker and then changed into an edgy Hoist). Cobotron wrote: While I'm perfectly fine with this Siege Barricade, am I alone in thinking that TLK Deluxe Barricade made for a pretty serviceable CHUG crossover? I mean, I agree with you, my TLK Barricade can move up to the Generations shelf. He's pretty good for that aesthetic. He isn't just red and blue he also has yellow and all of those unique paint loadouts. He is less generic then both Prowl and Bluestreak. AllNewSuperRobot wrote: A different face sculpt for Barricade would have been nice. Make him stand out a bit more than having a 'reverse-Prowl' colour palette. Expected it maybe, but nobody wanted it. Try again. Many wanted it, and a few years ago some people paid double-triple what this figure costs to get essentially the same thing from the club. This is just one if those things I'll never understand, isn't it? I am sure you could understand a fan's excitement over seeing something that homages both a design they thought they would never get and a very expensive toy they thought they could never get. I use TLK Barricade for my generations collection and plan on also getting Siege Barricade. I haven't decided yet which one will remain Barricade and which one will be headcannoned into someone else. What isn't surprising, the more I see it, is HasTak look for any way they can to get out of doing anything new or remotely creative to make their money. Meanwhile a certain section of the fanbase willingly seems to bend over backwards to encourage said laziness and lack of creativity. It's a bloody headsculpt dude, the intention was a Guidi inspired G1 Barricade based off the same cartoon vision as the whole line in general. Same reason why Impactor is based off the Marvel comics version that fits the G1 cartoon aesthetic more. It's not lazy or uncreative it's just not what you want. Or, y'know, steel molds are very expensive to make, and if they can make a character people want with tooling that they can also use for a separate character people also want, instead of a one-time use, then they can divert some of that mold-making money to other characters that might comparatively more require unique tooling. Deadput wrote: It's not lazy or uncreative it's just not what you want. This repaint, Overpriced Prime and MP Bumblebee 2.0. The overall decline in quality of the G1 MP line, the entire evergreen concept for the underlines. All point to the same conclusions. It's not about personal tastes or preferences, it's about the larger picture. Being able to see the wood from the trees, so to speak. Barricade looks almost exactly like the stylized poster art we saw with him a last year, shocking! The original Powertrain mold wasn't all that great, it's nice to see such a vastly improved new mold for him. Emerje wrote: Barricade looks almost exactly like the stylized poster art we saw with him a last year, shocking! If we got a head more in line with that it would be better. As it is, Larrycade just doesn't cut it.